Chinese tech giant Xiaomi has released a new Mi Band a few months ago. And its selling very well. Xiaomi says it shifted over 5 million Mi Band 3 units globally in a little over 3 months. The company had reported earlier that it sold over a million units in the first 17 days since the tracker was made available in early June. That’s not really too surprising. While not as comprehensive as some of the other options out there, this is a fitness band that delivers a lot for the price. Plus, with its lightweight, slick design, it looks good enough to wear during the day, in the office or for an evening function. The latest band combines the best features of the predecessor devices and throws a better screen, water-resistance, all day heart-rate monitoring and NFC into the mix. So is this a worthy upgrade? Read on to find out. Xiaomi’s latest creation comes in a small box that contains the core unit housing the sensors, a silicon band and the propriatory charging unit. The device certainly looks more slick than its predecessor. The glass is curved this time around and the silicon band feels very comfortable. The whole thing has a 5 ATM water-resistance rating which means you can dunk it down to depths of 50 meters. The strap is interchangeable and you can switch between Graphite Black, Hot Orange and Deep Blue options. At only 20 grams you’ll hardly feel it on your wrist. The overall design of the third generation tracker is actually very similar to that of its predecessor. The little core slips neatly into the thin silicon band, and everything feels nice and snug once you snap the band into place. Despite taking it on multiple runs, I never had the feeling it might become undone. There are ample size settings on the strap, so it should fit most wrists. You can wear the tracker on either hand, as long as you specify in the app the band position. For the purposes of this test I wore my device of choice the Garmin Forerunner 935 on my left wrist and Mi Band 3 on my right. Similar to the Apple Watch, the unit can be activated through gesture. As the pictures show, Mi Band 3 also has a round sensory control button along the bottom edge. You wake the screen up by resting your finger against the button or lifting your wrist. Flicking with your finger on the screen will cycle through the time and date, how many steps you’ve taken, distance, calories ,heart rate data and battery life. Swiping down shows notifications. App settings also allow you to customize the tracker to show call alerts, event reminders, alarms, app notifications and more. I’m not sure if the unit I bought was slightly defective, but I found responsiveness of the screen leaves quite a bit to be desired. At times I found myself repeatedly swiping before the thing would react which was frustrating to say the least. Having said that, the control button which works like a back key did its job seamlessly whenever I touched it. The 0.78 inch, 128×80 pixel, OLED display has an oval shape which blends well with the strap. There is improved pixel resolution this time around, the display is larger and its touch sensitive. But while the screen is very visible indoors, the same cannot be said if you’re sporting it outside on a bright, sunny day. If you’re doing a run in these conditions, you will struggle to read anything. The picture below shows how much (little) you can expect to see. All things considered, Mi Band 3 is not a looker but it hasn’t been hit with an ugly stick either. I would categorize it as sporty and rather plain looking. The core unit houses an accelerometer for measuring steps and distance and an upgraded optical heart rate sensor. You can also buy a special edition that comes with an NFC chip for making payments on-the-go. I was testing the non-NFC version. One of the most important draws of Mi Band is its battery life. And on that count the latest band does not disappoint. Despite the bump in specs, the 110mhz rechargeable Lithium polymer battery keeps the gizmo running for up to 20 days (on standby). Tweak the heart rate sampling frequency to a higher rate and this will come down a bit. I certainly found battery life to be awesome and for the most part didn’t even think about charging. And when I did, a couple of hours on the charger was enough to fuel it back to full capacity. Charging consists of poping the tracker out of its band and slotting it into the proprietary cable and USB port. The most important question is whether the Mi Band 3 can do everything you need. The answer pretty much depends on your expectations. For the price, the little gizmo can do a lot. As a basic fitness tracker, the band tracks steps, distance and calories fairly well. Pretty much as any other fitness tracker does. Its light and comfortable enough to wear in bed and sleep tracking is automatic. 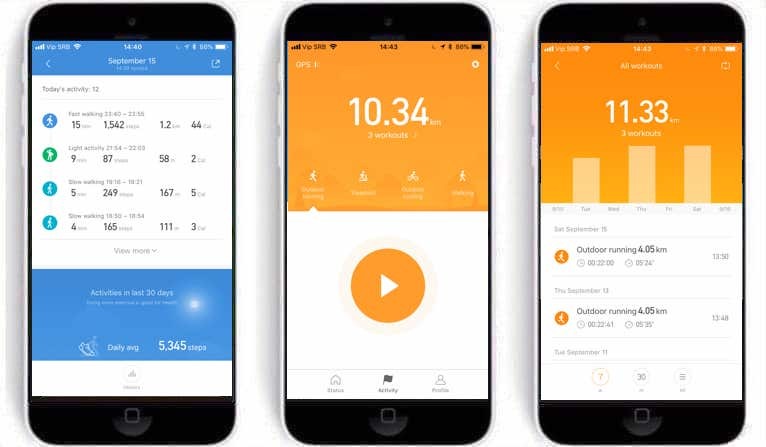 Heart rate monitoring is around the clock and the app allows you to specify the interval at which the band will take a reading (1 minute, 5 minutes, 10 minutes or 30 minutes). As mentioned, the option you choose will effect battery life. When you sit still for too long, the gizmo will vibrate and a little walking man will appear on the screen to motivate you to get off the sofa. Toggle the option via the smartphone app settings if you do not wish to be disturbed. As with any fitness tracker you can tweak the daily step goal. If you are feeling ambitious, you can raise it from the default 8,000. To view your daily progress, simply lift your wrist up. For more detailed info, head over to the Mi Fit app. You info will find its way from your band as soon as you open it. You can also initiate a manual sync by pulling down on the screen if for some reason the app does not pair. I have not run into difficulties though. By the way, don’t expect an overly sophisticated app. But the basics are there. Also, on the positive side, you can sync with Apple Health and Google Fit. The main dashboard shows a snapshot of your daily activity. Tapping on pretty much any metric will take you through to a screen with more details. Heart rate, in particular, has benefitted from an upgrade. Whereas before it was only on-demand, now the tracker will spit out your resting heart rate in the morning and a chart showing how your beats have changed throughout the day. Sleep tracking is there as well. The main stats show your nightly rest split between time awake, light sleep and deep sleep. More usefully, the app awards a sleep score in the morning and lets you know how this stacks up against the average user. It also spits out sleep insights. For example, this morning I was told that I go to sleep too late, and that my deep sleep time is pretty short. The new and improved Mi Band is also better at differentiating between walking, running (treadmill and outdoors) and cycling. Thanks to auto-recognition, your activities will be monitored automatically. To be on the safe side, you can start an activity manually from the app. Unfortunately there is no way to do this from the band itself or for a way to add other activities. Which is a bit of a nuisance. For those that are wondering, swimming is not on the list of activities that are tracked. Hopefully Xiaomi will add this through a firmware update. Don’t expect the heart rate monitor to work under water though. Optical sensors struggle to come up with accurate stats in these conditions. In the meantime, you can wear your tracker in the swimming pool, bath or shower, but it won’t track anything. I’ve strapped Mi Band 3 to my wrist a number of times during the past few weeks when running. Its important to tighten up the band when doing this so that the heart rate sensor has good contact with the skin. Following one of my runs, I noticed that my heart rate was not captured. Presumably the tracker did not have good enough contact in that instance. As mentioned, there is no built-in GPS, but the band piggy-backs into your smartphone signal to produce a map of your run and quite detailed stats. This includes time, pace, calories burned, average speed, step frequency, heart rate, total steps, stride and elevation. You also get info on heart rate zones, lap by lap information and a plethora of charts. The level of detail is quite impressive considering its such an inexpensive device. In terms of data quality, I tested the tracker against the Garmin Forerunner 935. Steps were fairly in sync with Mi Band 3 reporting a slightly lower step count. Sleep stats were impressively close, but again not exactly the same. The difference was typically up to a half an hour depending on the night. The resting heart rate was higher by 3-4 beats on Mi Band. Calories were off slightly more but its a well known fact that fitness trackers don’t do a good job when it comes to this metric. Running info was impressively close as well. Here are the stats comparing my last 4km run. The first metric comes from Mi Band 3, the second from Garmin Forerunner 935: time (22:41, 22:32), pace (5:35, 5:37), calories (250, 307), average speed (10.73 / 10.7), step frequency (190 / 192), average heart rate (159 / 156), max heart rate (174 / 171), stride (93 cm / 9 cm). Heart rate zones: zone 1 (1 min / 1 min), zone 2 (1 min / 1 min), zone 3 (3 mins / 2 mins), zone 4 (18 mins / 19 mins). So while most of the stats were in sync, Mi Band showed a slightly higher average and maximum heart rate. The discrepancy in overall time was to do with me fumbling around getting both devices to start tracking. Finally, the new Mi Band also has some smartwatch-type functionality. Its fairly barebones, but the display can show you the time and date, the weather forecast, incoming phone calls, messages, emails, and other notifications. The app has always allowed you to locate the Mi Band but now you have the option to locate your smartphone from the fitness tracker. Select the option and your smartphone will emit a sound. Mi Band is known for two things, its incredibly low price and great battery life. The latest generation doesn’t break this formula, slapping on some significant upgrades along the way such as water-proofing, all day heart rate, a better screen and more. The range of features on offer make this a great wearable for those on a budget. Of course, its not quite on-par with some of the more expensive options out there, but its close. And while the app would benefit from a design overhaul and the OLED screen is a bit temperamental, the stats it dishes out are fairly accurate. It also does a surprisingly decent job at tracking runs. Certainly good enough for the occasional runner. Make no mistake, Mi Band 3 won’t challenge any serious running watch or high-end fitness tracker. But its a great option for the casual user or as an entry level device. Sure there are some compromises, but you’ll struggle to find a wearable that does so much for the price. If you’re looking for a basic fitness tracker and don’t want to spend lots of money, Mi Band 3 does the trick.